Los Angeles, CA, USA, and Novosibirsk, Russia: December, 12, 2017 – LEDAS Ltd., a leading provider of software development services for the CAD/CAM/CAE/PDM/PLM market, and Mechanodontics, a U.S. developer of innovative dental solutions, today announced signing the license agreement for the LEDAS Cloud Platform (LCP). “We expect that entering into this licensing agreement will help Mechanodontics decrease time-to-market since LCP provides data storage/management, 3D visualization, and communication while delivering all features in the most familiar environment today – the web browser," said Mehdi Roein-Peikar, the co-founder of Mechanodontics. “At Mechanodontics our goal is to help as many people as possible straighten their teeth and improve their smile in the least amount of time and with the least amount of pain. Our braces can also be placed behind the teeth so as to not be seen. LEDAS is allowing us to focus on the development of our novel orthodontic products and technologies, with software side development and customization done by the LEDAS team on the basis of LCP." LCP is a scalable cloud platform, which consists of a client-server stack of technologies adjusted to needs of CAD users and specifics of CAD data and processes. It combines the reliability and scalability of Linux web servers, used for dispatching of users’ requests, with the ability to use third-party 3D geometric engines and libraries that historically have been based mostly on Windows. The functions of 3D data storage, access, viewing, navigation, management, and collaboration are available “out of the box,” while data editing can be provided upon request for particular use-cases. LEDAS Cloud Platform is available for licensing of its binary code and partial access to the source code. "We see a major interest in LCP from different engineering industries," said Nikolay Snytnikov, head of the LCP project at LEDAS. 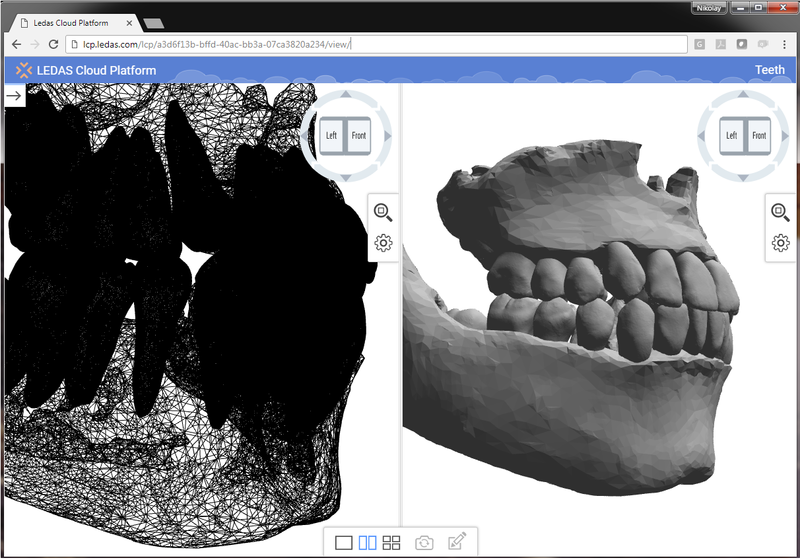 "The approach behind LCP is very flexible: it allows users to work with different types of 3D data in a browser, yet at the same time virtually everything can be customized or added, by the licensee’s development team or by LEDAS experts. This is critical for the project with Mechanodontics, because treatment plans include types of 3D data, and their management requires numerous special functions, which, in this case, will be developed by our team."